Over a year ago, American president, Barack Obama, announced plans to resurrect diplomatic relations between the USA and Cuba. While, this does not mean that the trade embargo has been lifted or Americans can travel freely to Cuba, over the last year there has been a significant positive shift in relations. So what does this mean for the tiny island located 90 miles off the coast of Florida? Most think Cuba is about to undertake an unprecedented tourism boom. And like any explosion, there will be collateral damage, in this case the charm of an old-school world which may soon be washed away by a corporate tsunami. What this means for corporate meeting planners is that the clock is ticking. Now that the floodgates have been diplomatically opened, the streets filled with 1950s Fords and Chevys with big fins are most likely to be replaced by top-of-the-line Toyota SUVs, and advertising boards with paintings of Fidel Castro and Che Guevara will soon be covered over by a Pepsi adverts. Marriot International President Arne Sorenson is one of many companies eager to do business in Cuba, especially as more Americans travel to the island. “With travel to Cuba now surging, existing Cuban hotels are full and hotel companies from other countries are racing to tie up as many of the new hotels as they can before the likes of Marriott and our U.S. competitors show up,” Sorenson said in a recent U.S. News & World Report interview. Current hotels may not have as many deluxe amenities that U.S. corporate travellers expect, but Iberostar, the Spanish-based hotel company, has a few properties in Cuba one of which is the Hotel Parque Central, considered by some the best in Havana. Iberostar also has a 5-star rated all-inclusive resort in the Varadero Beach area of Cuba. So for corporate incentive planners tired of sending their top salespeople to local golf resorts, the timing is just right. In the US, travel restrictions have lifted, allowing ferry services to Cuba, and Carnival Cruises is lined up to set sail early in 2016. American, Delta and United have all expressed an interest in operating flights to Cuba and, since early July, JetBlue has operated a weekly charter from New York’s JFK to Havana – the first major airline to do so since restrictions were lifted. You can also book a hotel room or a car through services such as Airbnb. But that doesn't mean there isn't still time to enjoy perfect beaches, traditional foods and the unblemished hospitality of its people. When travelling to Cuba, you’ll also find that you won’t be annoyed by people chatting on their cell phones at the table next to you while dining out, or get run over by a teenager in the street with her head down and her thumbs doing the texting tango. It’s been estimated that only 5% of the population has regular access to the internet and less than 20% own cell phones. But all that will change quickly once telecommunication giants like Verizon and AT&T land on the Cuban shores and cell phone towers start sprouting up like trees. And it will all happen sooner than later. Earlier this summer, 35 public Wi-Fi areas opened across Cuba. Cuban citizens are panting for technology and connectivity, and they will eventually get their wish. 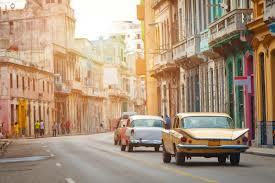 Cuba is already the second-largest tourism destination in the Caribbean, surpassed only by the Dominican Republic. Last year, Cuba received 3,001,968 stopover visitors — a 5.3% increase — and during the first quarter of this year the Cuban Tourism Ministry said it received a record 1.14 million travelers. The Cuban government estimates that if there were unrestricted travel from the United States, annual trips by Americans would increase by 1.5 million, generating an extra $2 billion in revenue. It’s safe to say that much of that revenue will come in the next few years from big and splashy hotels, corporate skyscrapers, Apple stores and McDonald’s. The fear isn’t Cuba turning into Las Vegas but becoming another Atlantis or Dubai, where commercialism has never been reeled in and the words “Bigger is Better” might as well be the national motto. With all we know about Cuba, both past and present—and there are plenty of political warts-- some Corporate Travel Management (CTM) companies may still have issues suggesting to their meeting planners and incentive clients that partaking of the old-world charm of Cuba, before it starts to vanish, is well worth their consideration. That perhaps staying in the Hotel Ambos Mundos in Old Havana might be better than holding out in order to stay in a high-rise hotel that could be in Las Vegas or Los Angeles, even though the view may still show buildings withering under decades of neglect. Maybe it’s time to start thinking out-of-the-box, before the box gets covered in shiny paper with a neon-lit bow on top? Because it’s been closed so long there’s still a mystery about Cuba, so the time is right to experience something close to home but still off the beaten path. Once restriction-free travel is allowed for U.S. citizens this island nation will fast become the most popular Caribbean destination for tourism and corporate business travel. And once that happens the clock will start ticking if you want to see Cuba as it was and as it is, before everything old is new again.